Another pair of confusing words, fill and file are quite confusing, especially when used with -ing attached! There is a difference of just a ‘L’ and that makes the whole meaning different. The meaning is easy to understand and remember, and today let’s fill our mind with these 2 new words and few examples where we can use them. Fill as we know is to occupy a space with something. For example, fill the bottle with water. · I will be filling in for him for next two weeks. · He was filling the bag with chocolates when I saw him. · Her words were filled with emotion and love. · I went to the dentist to fill up the gaps in my teeth. · We made the pillow thick by filling the cloth with cotton. · Fill out the form quickly and submit it. Here, fill out, fill up and fill in are some phrasal verbs. · When you fill something to the brim, it becomes “full”. A file (noun) is something that stores text or images or any form of data. For example, an MS word document is a file. It is a ‘soft’ copy. A resume ‘MyResume’ is a file with the name ‘MyResume’. Similarly, file can be a hard copy too. Filing as the present participle of file means the action in present. For example, “I was filing the documents with my grandpa today.” You can re-write the sentence as – “I was helping my grandpa file the documents today” and it would mean the same. · Organising documents in a proper way – filing the papers. · Submitting set of papers for tax – filing tax returns. · Filing your tax returns can be a gruelling task unless you have agents to do the job. · Let’s do the filing today, so that we can concentrate on the presentation tomorrow. As we see, there are plenty of ways in which file and filing both can be used. With a single ‘l’ missing, the words are easy to be misread, and one has to be careful in readying them. The conclusion – The words fill and file are in no way related but can be confused because of the “looks”. · Filling the cake with strawberries will give a nice flavour. File the ends of the cake to make it even. · My heart fills with respect for those who file their taxes properly and on time. · Instead of filing a complaint right away, fill up the form and wait for the authorities to respond. · You don’t have to fill in for him, let him organise the files when he comes back. · A case has been filed against those who have filled the area with trash. · Hope this article filled your heart with joy and you will file it with your personal favourites. 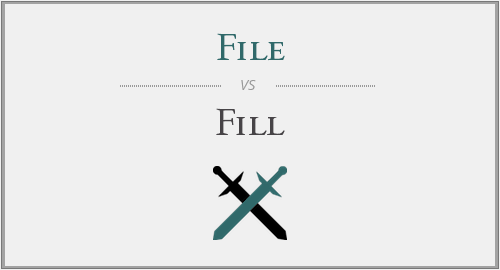 "File vs. Fill." Grammar.com. STANDS4 LLC, 2019. Web. 22 Apr. 2019. <https://www.grammar.com/file_vs._fill>.